Today, June 28, 2014 is the centenary of the assassination in Sarajevo of Archduke Francis Ferdinand and his wife, Sophie, Duchess of Hohenberg. This started a series of events that led, within two months, to the outbreak of a war unprecedented in its ferocity and breadth; one that would cause about ten million military and seven million civilian deaths. It may have created the conditions that led to the 1918 influenza pandemic that is estimated to have killed between fifty and 100 million people; perhaps as much as five per cent of the world's then population. The war's economic and political aftermath certainly contributed to the outbreak of an even greater war two decades later. It caused the breakup of two empires: the Hapsburg Austro-Hungarian Empire in central and eastern Europe, and the Ottoman Empire that encompassed much of the Middle East. The carving up of the latter by victorious Britain and France, as described in David Fromkin's A Peace to End All Peace, resulted in the creation of the existing national boundaries in the Middle East; many of which boundaries are contested today. The second line is ironic. One of Britain's appeals to prospective recruits was to fight for "small nations," in particular Belgium (again see poster above) that had been or might be invaded and occupied by German troops. The irony is that Ireland was a "small nation" that wanted to be free, but Britain would not allow it to be. The term "wild geese" in the first line was originally applied to the Irish Jacobite army that was allowed to go to France following its defeat by the army of King William in 1691. It was later used for Irish soldiers who served in the Royal Army in European wars. What's happened to the border? For once won the day. We all live in the world the Great War (I still call it that; the Second World War was vastly more destructive, but the effects of the First include the Second and much more) created. I pray we do not have to see its like again. Addendum: When I posted this, I speculated that Private McBride was likely Protestant, because William would not have been a popular name among Irish Catholics given the unfortunate role of King William in their history. Dermot McEvoy corrected me on this, noting that William was a common name in his (Catholic) family, and that Liam Clancy was christened William, later changing his name to its Gaelic version. William is a popular name among Ulster Scots Protestants, probably because they revere King William for his victory over the Catholics. 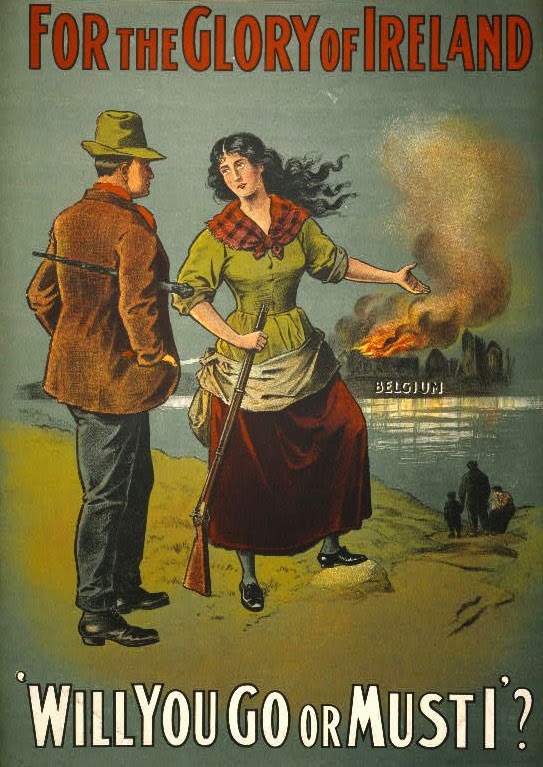 Many Ulster Scots emigrated to America, where they became known as "Scotch Irish." Many of these settled in Appalachia, and the term "hillbilly" reflects the prevalence of the name William among them. At last, a perfect baseball day. The perfection of the day was completed by my favorite Designated Hitter League team, favorite by virtue of their representing my old home city although they didn't exist when I lived there, the Rays, beating the Astros 5-2. Also, my wife's team, the Red Sox, topped Oakland 7-6. Out of spousal loyalty, but also because I like the team, I root for the Sox whenever they're not playing the Mets or the Rays, and especially whenever they're playing the Yankees. Unlike my law school classmate and friend Richard B., I am a Yankee hater, though I share with him a liking for the Orioles, my third favorite AL East team. The first Major League regular season game I attended, in the summer of 1970 shortly after I first took residence in New York, was a Yanks-O's game won by the Birds on a two-run homer by Boog Powell. So what, those of you from outside the New York area (and maybe even some of you in it) may be asking, is that odd-looking logo at the head of this post? Well, the "B" is a near, though not exact, copy of the "B" on the cap last worn by the Brooklyn Dodgers. The "C" looks almost as if it could have been lifted from a Chicago Bears cap or helmet, but theirs is more elongated. What it stands for is "Cyclones." 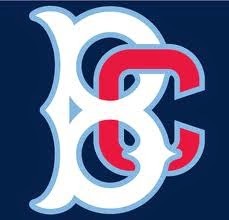 This is the cap emblem of the Brooklyn Cyclones, the Mets' Class A minor league affiliate that plays its home games in lovely MCU Park by the beach in Coney Island. I hope I don't jinx them by noting this, but they're off to a very good start, with an 8-2 record that is best in the New York-Penn League (this is a "short season" league). The Cyclones also won on Sunday, defeating the Aberdeen Iron Birds (an Orioles affiliate whose emblem is a jet fighter) 2-1. On the subject of minor league action, the above video of sparkling defensive play by the Toledo Mud Hens (my third favorite minor league team name, following the Cyclones' league rivals the Batavia Muckdogs) has been making the rounds, and got to me courtesy of high school classmate Pete Cook. Terrific play by the second baseman and shortstop, but I'm not sure about the call at first. Any opinions?